The RodeoHouston logo and the 'leaked' lineup, as it is circulating on social media. 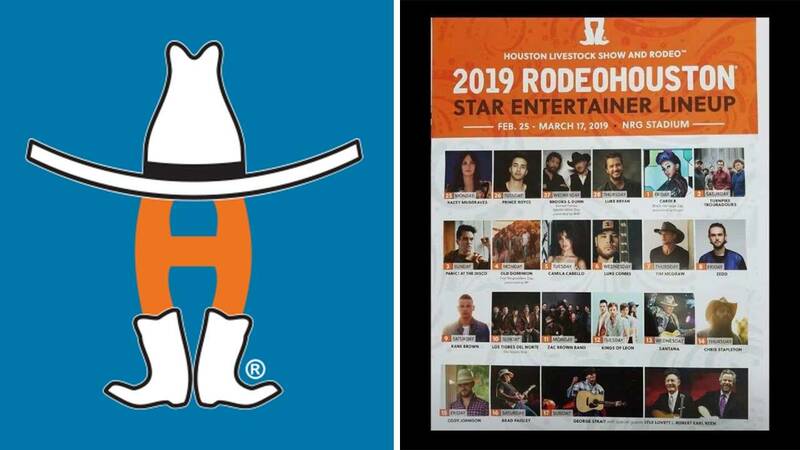 HOUSTON - The Houston Livestock Show and Rodeo is responding after an image began circulating online of a 2019 RodeoHouston lineup. The Rodeo is saying you're going to have to wait. Entertainers on the "leaked" lineup flier include: Kasey Musgraves, Prince Royce, Brooks & Dunn, Camila Cabello, Luke Bryan, Cardi B, Panic! at the Disco, Old Dominion, Luke Combs, Tim McGraw, Zedd, Turnpike Troubadours, Kane Brown, Los Tigres Del Norte, Zac Brown Band, Kings of Leon, Santana, Chris Stapleton, Cody Johnson, Brad Paisley, George Strait, Lyle Lovett and Robert Earl Keen.